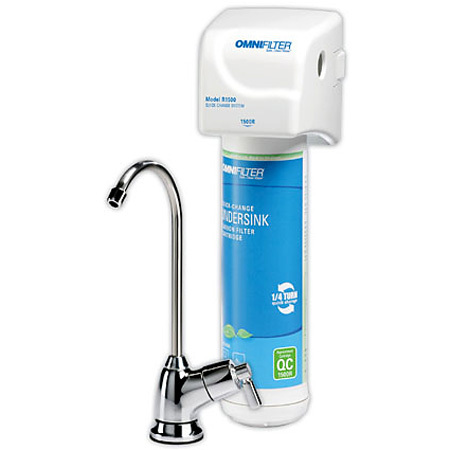 Model R1500 is OMNI's Quick Change Under sink Water Filter with quick change cartridge to reduce rust, sediment, chlorine taste, and odor. The new quick change model makes installing cartridges easier than ever with just a 1/4 turn to remove or install. This easy, no mess water filter system installs quickly and includes the installation kit. Also this system avoids the hassle of changing O-rings because the rings are preinstalled onto the cartridge. Filterhead/Cover assembly, Fittings kit, Lead-free faucet kit, 6ft of 1/4inch plastic tubing, 1500R filter cartridge, Mounting screws and bracket, Inlet supply adapter, TeflonR tape. R1500 Series Data: The 1500R Cartridge is used on the R1500 mount.